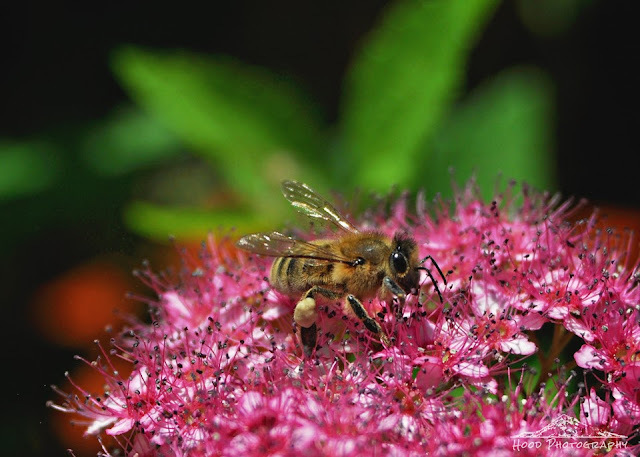 This happy little bee was working hard at collecting pollen off a spirea shrubs delicate pink flowers. Nice macro shot of the bee! Wow, it is so detailed. Love it! See the twinkle in it's eye! Great! What an adorable little bee! So cute. Your Spireas are ahead of mine, which are not blooming yet. Great macro and nice details. You capture this little one beautifully! Excellent macro of the bee. Nice detail of light on the eye. Excellent macro shot of this busy bee. Beautiful detail of the flower and the markings on the bee's wings are exquisite.